Frequency splitting divides a sound’s frequency spectrum into sections, allowing you to alter one section of the spectrum without changing the rest. It’s especially useful for sounds — like dubstep basslines — which include frequencies all across the spectrum. Experiment with adding different effects and with shifting the frequency bands around. 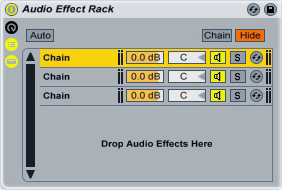 If you want the effects to be more subtle, move the Audio Effect Rack to a return channel, then send the source sound to the return.